Today I have for you the most refreshing summertime drink ever! It’s one of those drinks that I can’t stop drinking, which is a good thing because it is all natural, organic and simply amazing! 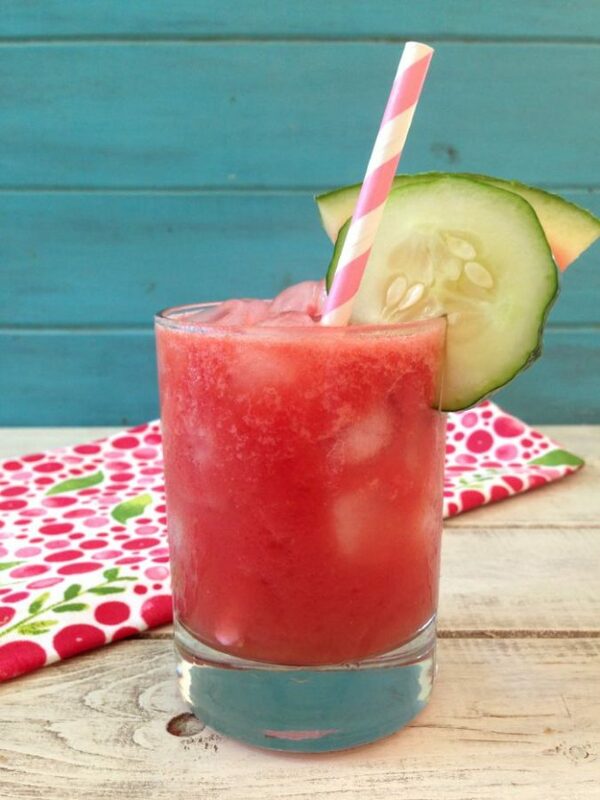 It is my Cucumber and Watermelon Cooler! I got this idea for my drink by all of the wonderful produce that I got from Farm fresh To You! 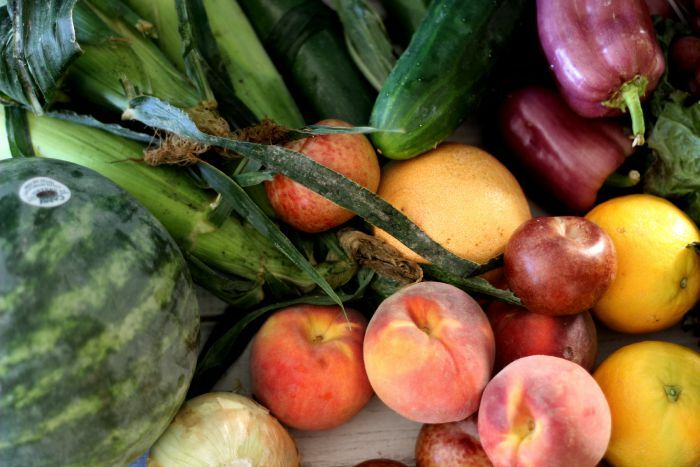 I signed up for a monthly service to receive organic fruits and vegetables to be delivered to my front door. It saves me a trip to the grocery store and it inspires me to try out new recipes. Plus it helps that they supply recipes with my box of goodies and website. You can check out my Instagram picture with all of the goodies I got from my box. I got so much wonderful produce! I got ASSORTED LETTUCE, BI-COLOR CORN, DAPPLE FIRE PLUOT, MINI SEEDLESS WATERMELON, MIXED HEIRLOOM TOMATOES,PURPLE BELL PEPPERS, RED GRAPES,RUBY GRAPEFRUITS, SLICING CUCUMBER, VALENCIA ORANGES, YELLOW FINN POTATOES, YELLOW ONIONS, YELLOW PEACHES, and ZUCCHINI. 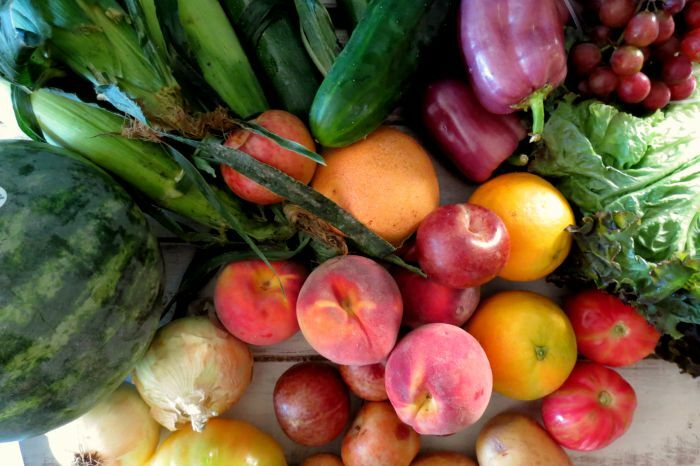 So much wonderful produce in just one box! Here are all of my beautiful vegetables. I didn’t get a chance to eat everything because I was going to Pennsylvania a couple of days later, but my Husband told me he enjoyed all of the fresh produce. He told me he made mashed potatoes with the Yellow Finn Potatoes, served with a side of steak. I asked; did you take a picture? He looked at me and said no! He also ate all of the peaches, and grapes. Lucky for me he left me the cucumber and watermelon! The day the package arrived we did eat the corn. It smelled so good and I couldn’t resist it. You can check out the photo of the corn here. Here is all of the beautiful fruit that we received. I love the photo, it looks like Fall to me. As you can see why I was inspired by my produce for today’s recipe. 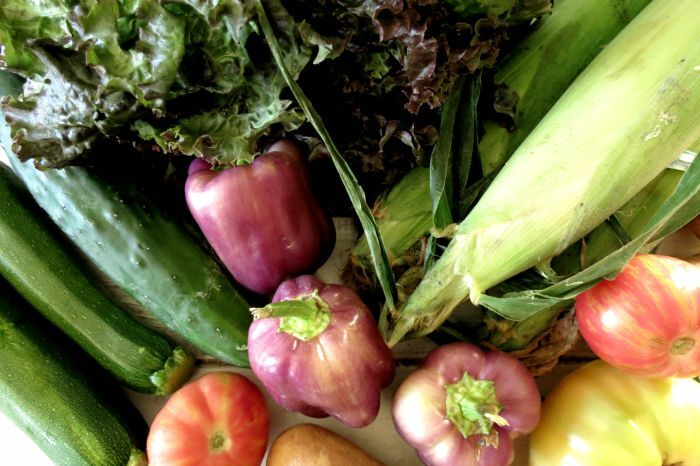 If you checked out some of my recipes this week, you will see some of my produce from Farm Fresh To You in it. Now for my drink! Let me tell you this drink tastes amazing! It’s so light, fruity, naturally sweet and totally refreshes you on a hot summer day. 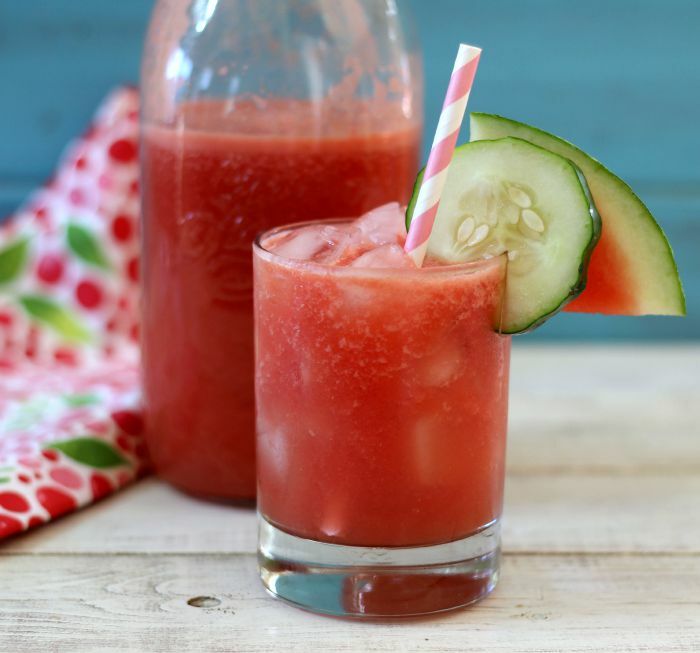 It’s made with 4 simple ingredients, seedless watermelon, cucumber, lime juice and honey. I didn’t have to add too much honey because the drink is naturally sweet. Plus what I love is that the produce I used from Farm Fresh To You is all organic. You couldn’t ask for a more natural drink. 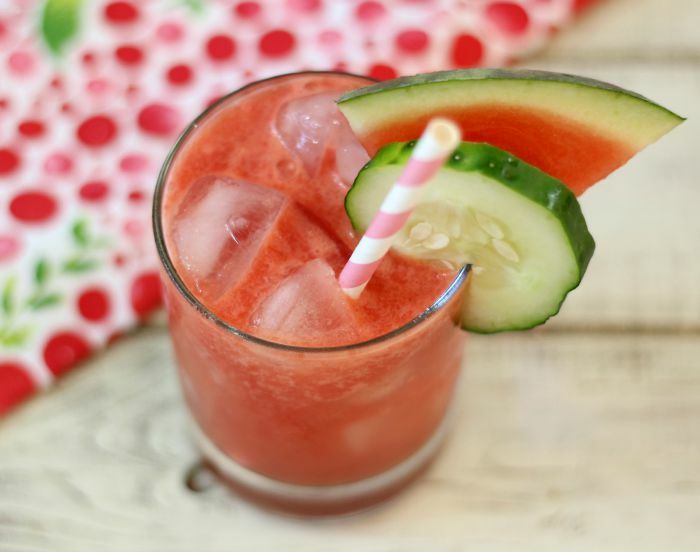 A light, natural, organic refreshing drink made with watermelon, cucumber, lime juice and sweetened with honey. In a blender add watermelon and cucumber and process until smooth. Take a sieve and place it over a bowl. Pour the juice into the sieve and with a back of a spoon push it through the sieve. This will make your drink thinner and clearer. If you want to think out the juice more, run through the sieve a second time. Add the juice back to the blender and add the key lime juice and honey. Blend until combined. 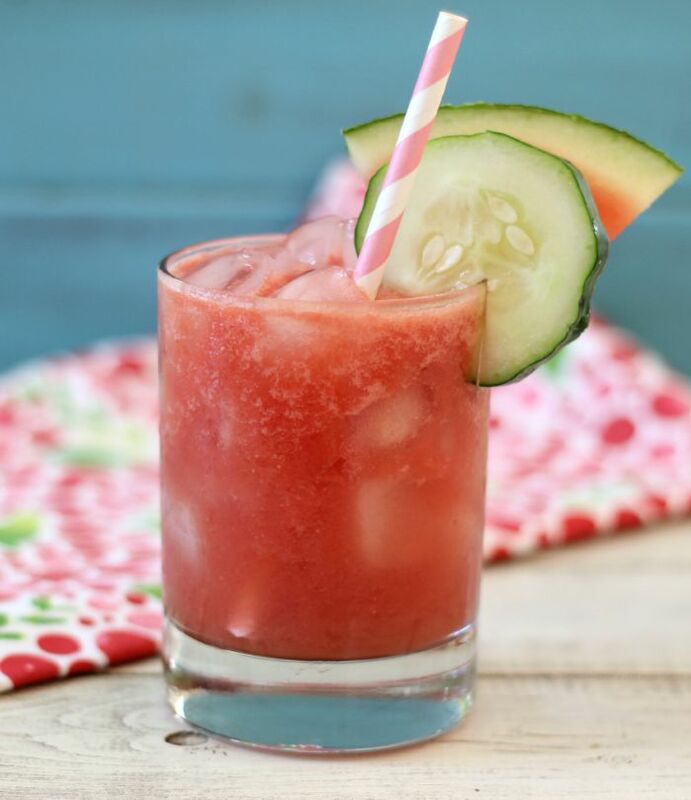 In a glass add ice and pour over the Cucumber and Watermelon Cooler. Serve cold. Can be refrigerated for up to two days. Also, not only does Farm Fresh To You has produce but they also have olive oil, organic eggs or fresh flowers. I love that! Plus you can get a weekly, by-weekly or monthly delivery. I signed up for the monthly delivery. Plus they have several different kinds of boxes that you could want They have just fruit, vegetables, fruit and vegetables or a surprise me. It’s pretty cool. I got the big mixed fruit and vegetable box. 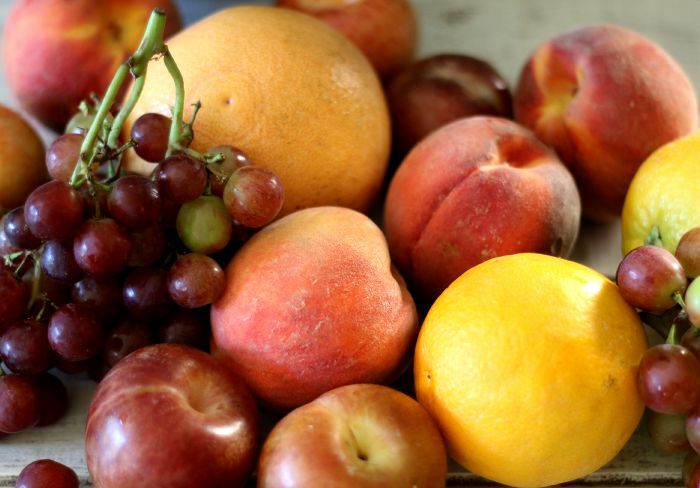 Are you worried that you will get produce you won’t like? No worries! A few days before your delivery you will get an e-mail stating you can customize your box. So if you don’t need oranges, skip them and add potatoes. It’s a great service and I really like that I can customize the box. That means no wasteful produce. If your interested, I have a referral link that will give you $10 of your box! You can try the service and cancel at anytime. They have great customer service. You can get your discount by using JENN9232 referral code. I hope you are enjoying all of the fresh produce that summer has to offer. This is a Sponsored Post from Farm Fresh To You and Socialite.